You’ve found a hair stylist resume example that’ll make you look like Sally Hershberger or Ted Gibson. But first—hang on to your hot rollers. Everyone needs their hair done. Some will pay a lot more to get it right. To cut their hair—and have fun doing it, you’ll need a salon resume that boosts you like a vat of volumizing mousse. Don’t frizz out. With a little effort, your skills and achievements can snag the hiring manager and get the job. A hair stylist resume example better than 9 out of 10 others. How to write a hair stylist resume that gets more interviews. Tips and examples of how to put skills and achievements on a hairstylist resume. How to describe your experience on a resume for a hair stylist to get any job you want. 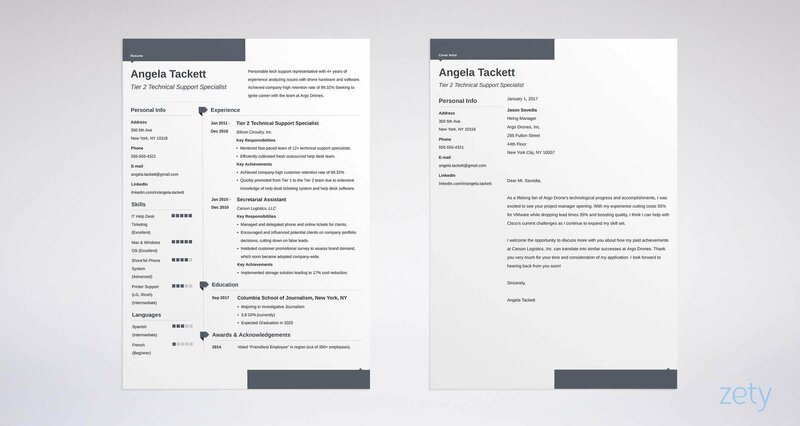 Here's a hair stylist resume template made with our online resume builder tool. Hair Stylist Resume - See more templates and create your resume here. What's the Best Format for a Hair Stylist Resume? Does your hair stylist resume format really matter? 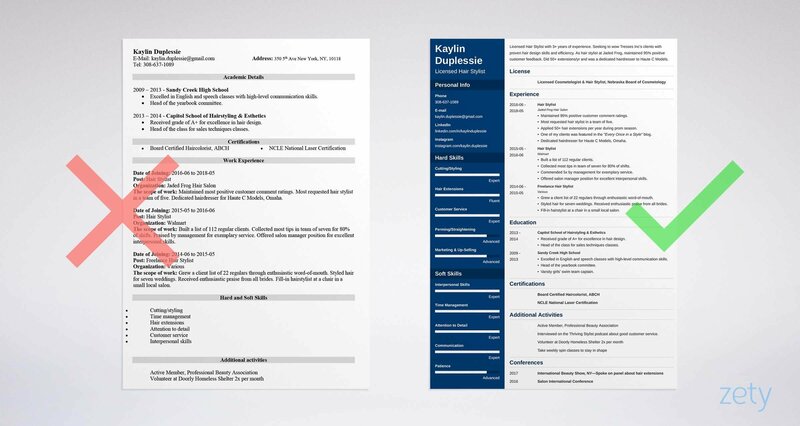 Your cosmetology resume format needs to show you thrive on details. Start with the reverse-chronological layout. It adds highlights to your most recent accomplishments. Use white space, the best resume fonts, and grabby headings to strobe your best features. Last, save it as a PDF. Hairstylist resumes in PDF format are machine readable. They hold like sculpting gel from one computer to the next. Just check the job offer to make sure the ad doesn’t ban them. Pro Tip: Switching to the hairstylist world from another line of work? Try the combination resume format for your hairdresser resume. It blends in transferable experience from other jobs. Why worry about formatting if you can simply use a resume template for your hair stylist dream job. Resume Templates for Hair Stylists. See more templates and create your resume here. You sent your resume to ten salons. Eight called you. How did you work that magic? You got the hiring manager to read your whole resume. Nope. Most hiring managers spend just six seconds on each resume. If you can get them to stop skimming and start reading, you can nab the interview. Do that with a resume summary or resume objective. If you lack experience, use a resume objective. It shows passion when your work history still has bed head. If you’ve got more experience than Frédéric Fekkai, use a resume summary. It uses your accomplishments to knock ‘em flat. Cram either with achievements that go full foil. These two professional hair stylist resume examples demonstrate. What’s overprocessed about the first of our hair stylist resume samples? Passionate, experienced hair stylist with excellent skills in hair cutting, permanents, hair coloring, and extensions. Responsible for all cutting and styling duties at Jaded Frog Hair Salon for two years and as a Walmart stylist for one year. That’s not bowl-cut bad, but it won’t pile up the interviews. Licensed Hair Stylist with 3+ years of experience. Seeking to wow Tresses Inc's clients with proven hair design skills and efficiency. As hair stylist at Jaded Frog, maintained 95% positive customer feedback. Did 50+ extensions/yr and was a dedicated hairdresser to Haute C Models. On fleek. The accomplishments with numbers work it. Don’t have that much experience? See the next two beginner hair stylist resume examples. If your experience is still in curlers, use a hairdresser resume objective. Energetic, organized hair stylist, skilled in extension application and cosmetology. Great personality and attention to detail. Haven’t held a title as an official hair stylist yet but I learn fast and I’m very responsible. Enthusiasm counts for a lot. But you’re up against candidates who have that plus experience. Passionate hair stylist with thriving freelance business. Grew client list of 22 regular thanks to enthusiastic word of mouth from happy customers. Have styled hair for seven brides with glowing compliments about my work. Fill in occasionally at a chair in a small salon. But what if you have no experience at all? You do, or you can get some fast. Pro Tip: List a couple skills in your cosmetologist resume summary, but save most for your skills list. Write your hair stylist resume summary last so you’ve got plenty of raw material. Imagine a professional hair salon manager. Her name’s Una. What does she care most about on a hair stylist resume? But she doesn’t want three pages with enough details to stuff a beehive. And—she doesn’t want so little you could hide it under an induction cut. So—start with your most recent job. List 3-5 resume bullets with measurable accomplishments. The professional salon resumes examples below show how. Maintained 95% positive customer comment ratings. Most requested hair stylist in a team of five. Applied 50+ hair extensions per year during prom season. One of my clients was featured in the "Every Once in a Style" blog. Dedicated hairdresser for Haute C Models, Omaha. That’s lit. The salon manager just stopped daydreaming about thickeners. Your perfect hair stylist resume sold her on your skills. Responsible for cutting and styling hair for many clients. Applied hair extensions when needed. Pitched in with regular housekeeping duties. Well, hello, Lloyd Christmas. Nice bangs. But what if you have no experience at hairstylist jobs? Let these two beginner hair stylist resume examples guide your hand. I have no experience! Aargh! Done some cuts for people on apps like Hairline or SalonPick. If you haven’t, do them now. It’ll take a couple days and kirakira your new salon resume. The next of our beginner hair stylist resume samples slays it. Why does one of these two hair stylist resume examples float while the other’s nappy? Hair Stylist Experience: Haven’t yet held a full time hair stylist job, but I’m very trustworthy. The salon manager thinks you have a hockey cut. Grew a client list of 22 regulars through enthusiastic word-of-mouth. Styled hair for seven weddings. Received enthusiastic praise from all brides. Fill-in hairstylist at a chair in a small local salon. Now you’re in the Nicky Clarke zone. It didn’t take years to build up that experience. Pro Tip: Got a great hairstylist resume, but still not getting offers? Try walking in and talking with the salon manager about her needs. Matching a face to a resume is magic. Do you even need education on a hair stylist resume? But if you stop there, it’s like having an expensive formal finish and staying home and watching Netflix. So—add some relevant accomplishments that fit the job. Both hair stylist resume samples below are for a job that wants communication skills, a friendly personality, and sales skills. Received grade of A+ for excellence in hair design. Head of the class for sales techniques classes. Excelled in English and speech classes with high-level communication skills. Head of the yearbook committee. Varsity girls' swim team captain. Finesse. That’s not some fumble-fingers with a set of clippers. It’s Oribe or Kimberly Kimble. The speech and writing classes show good communication skills. The swim team and yearbook position shows you play well with others. Received degree in cosmetology and hair styling. Pro Tip: Do you need GPA in your pro hair stylist resume? If it’s impressive, go ahead. If not, trim it. You just got a great hair stylist job. You’re making such good tips you can afford a solid gold straightener. Your hair stylist resume convinced the hiring manager you had skills. If you’ve got the skills, you’re hired. But you need (1) the right ones and (2) you have to prove them. First read the job offer. Highlight or underline the hair stylist skills you see. Then find accomplishments in your past that match them like a face frame. List them in your hair stylist resume, plus a couple more so you’re not soft-soaping. (1) Built a list of 112 regular clients. (2) Collected most tips in team of seven for 80% of shifts. Commended 5x by management for exemplary (2) customer service. Offered salon manager position for excellent (3) interpersonal skills. Styled it. Do that and you’ll need a new appointment book to hold your interview requests. Get started with the hairstylist skills for resumes below. Need some professional hair stylist resume skills to start? Use this list. Add to it from hairstylist job descriptions online. They’re great resume keywords too. Pro Tip: Can you really prove your skills on a hairdresser resume? No. But you can convince the manager enough to walk in for an interview. You worked hard to get that license. So—plug it on your hair stylist resume. That way, no matter where the hiring manager looks first, she knows you’ve earned your duckbill clips. Pro Tip: Don’t put your license and certifications in the same section on a hair stylist resume. Your license is by far the most important, so give it a hard part from the rest. A robot can have experience and education. Nobody wants their hair cut by a robot. Show the salon manager how hard you work at cutting hair—and how much you care. Do it with special “other” sections in your hair stylist resume. Watch how in two hairstylist resume sections. I enjoy painting and someday I’d love to be an artist. That won’t tell me you style hair like Ted Gibson. Interviewed on the Thriving Stylist podcast about good customer service. Dig into your past. You’ll find gold nuggets to up style your hairstylist resume “other” sections. Even a membership in the Professional Beauty Association can volumize you. Pro Tip: To think up “other” bullets for your hair stylist resume, look at your skills list. Brainstorm anything you’ve done that proves you’ve got those skills. What About a Hair Stylist Cover Letter? Do you need to a cover letter with your hair stylist resume? Well, do you want the job? First, 40% of hiring managers insist on cover letters. Second, it’s free advertising space. It’s there, so use it well. Write one that grabs the hiring manager like a gas-powered crimper. First, use the manager’s name. Second, show her (1) you understand her needs and (2) you’ve got what it takes to meet them. This short example hair stylist cover letter does it right. I’ve wanted to work at Tresses Inc for years. I know you value talented cutters and stylers, but also seek great people skills and experience at adding hair extensions. Always end a cover letter with an offer. Try, “I’d welcome the opportunity to deliver hair styling excellence for Tresses Inc’s clients." 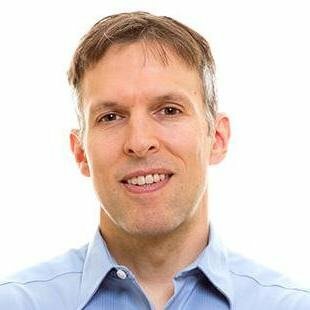 Pro Tip: Can’t find the manager’s needs? They’re in the job offer. If not, call an employee or the manager and ask about the shop’s challenges and frustrations. You wrote a great hair stylist resume. But no one called. You made a mistake with contact info on your salon resume. You even knew a “professional email address” meant no karenkutielips2996887@yahoo.com. But where is your portfolio? These days an online portfolio is crucial. Even if it’s just an Instagram account, have a place with pictures of your work. What styles and looks can you do? What’s your style of work? An online portfolio or an Instagram account will show the shop manager your versatility and talent. Pro Tip: Should you put a personal photo on a resume for hair stylist jobs? Not in the US. A photo can tousle the Automatic Resume Tracking software. Snip it. Write a hair stylist resume summary that makes the salon manager stop skimming. That means cramming it with your best 2–3 accomplishments. Pay attention to the hair stylist job description. Fit your hairstylist resume bullets to it like a magnetic diffuser. Add other sections that tease how great you are to work with. Include certifications, volunteer work, professional associations, and conferences. Send a hair stylist cover letter with your cosmetologist resume. Most managers insist on them, and they’re another chance to get the interview. Do you have questions on how to write a great resume for a hair stylist? Not sure how to describe your skills or achievements? Give us a shout in the comments! We’d be happy to reply.